What's in the box: Xbox One X Project Scorpio Edition 1TB Console, Project Scorpio Edition Wireless Controller, Xbox One X Vertical Stand, 1-month Game Pass subscription trial, 14-day Xbox Live Gold trial, HDMI cable (4K capable), and AC Power cable. Great for 1080p screens-games run smoothly, look great, and load quickly. Xbox One X Project Scorpio Edition 1TB Console. Be the first to experience the Xbox One X designed for the biggest fans—the Project Scorpio Edition featuring a custom design, “Project Scorpio” inscribed on both the console and controller, and a vertical stand. With 40% more power than any other console, experience immersive true 4K gaming. Blockbuster titles look great, run smoothly, and load quickly even on a 1080p screen. 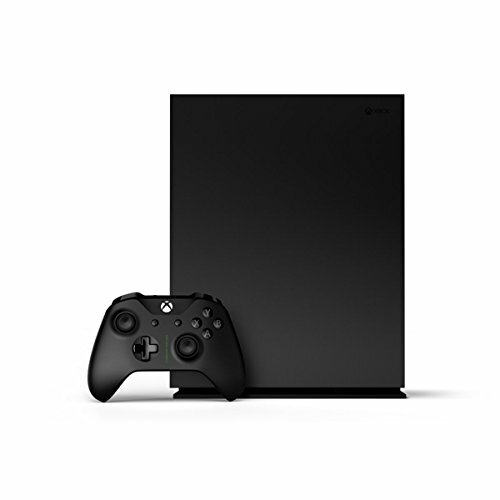 Xbox One X also works with all your Xbox One games and accessories as well as Xbox Live, the most advanced multiplayer network, giving you more ways to play.2 Games play better on Xbox One X. What’s in the box: Xbox One X Project Scorpio Edition 1TB Console, Project Scorpio Edition Wireless Controller, Xbox One X Vertical Stand, 1 month Game Pass subscription trial, 14-day Xbox Live Gold trial9, HDMI cable (4K capable), and AC Power cable.